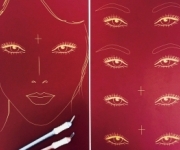 The Education team here at CosmeticTattoo.org keep a close eye on the scientific and medical literature for new publications relating to cosmetic and medical tattooing that may be of interest to our our members particularly in relation to high impact reports. Throughout 2017 we reviewed a total of 310 reports and where possible provided a link to many of the reports that were applicable and accessible via our social media streams on twitter and Facebook, more recently we have begun to formalise our notification about articles that we believe have particular relevance via our Science Library News Stream. 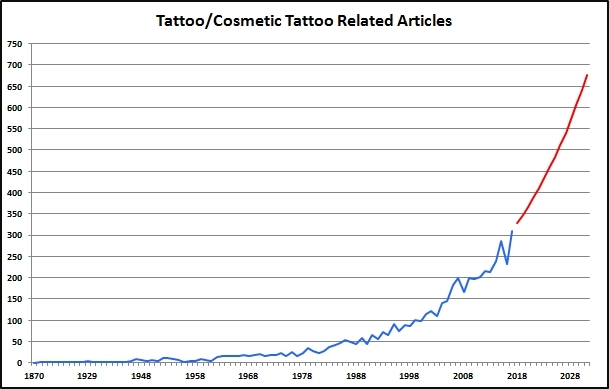 Over the decade ending in 2017 we have notice a steady increase in the number of articles published in reputable scientific and medical journals related to tattooing in all of its forms. The increase in number of articles published is obviously representative of an increasing interest by scientific and medical professionals in tattooing due to the potential medical and scientific applications, paramedical/camouflage services, psycho-social aspects and of course all the various health concerns related to the act of tattooing. We thought it would be interesting to take a look backwards at the previous publications over the longer term in an effort to illustrate the growing interest by the medical and scientific community in tattoo services. To achieve this an exhaustive search was conducted of 71 individual databases of Medical & Scientific literature over a 145 year time frame ending in December 2017. Searches were conducted related to specific keyword terms that would yield results specifically related to both contemporary and distant applications of tattoo services in all of its forms inclusive of adverse event or medical application, limited sub filters were used in an effort not to skew the results. The results of our searches were then reviewed on an individual basis to qualify relevance with the deliberate intent of capturing a broad range of articles that either directly or indirectly had implications for the tattoo industry and medical/scientific community, a few articles whilst not having immediate relevance were included due to the future potential/implications for tattoo services. 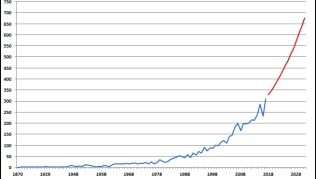 Results were then tabulated and are presented as an annual figure in blue line within the graph below. The results highlight a staggering growth in the number of annual publications over the past 145 years, in particular over the past 50 years there has been an average decade on decade growth of 81.5% in the rate of publications (1987: 93.0%, 1997: 81.2%, 2007: 98.5%, 2017: 73.8%), we have extrapolated this average growth rate forward (represented by the red line on the graph) to provide an indication of what future publication rates may look like over the next decade if this trend continues. To place this momentum into context we predict that over the next 14 years a similar number of articles may be published in the medical and scientific literature as has been published in the previous 145 years. Already there are indications that some medical and scientific experts are taking a special interest in the area of tattooing due to the enormous potential for a wide range of medical and technological applications, some medial experts such as Professor Jørgen Serup et al. from Copenhagen have shown an acute interest in tattooing due to the potential health effects. We have previously predicted future convergence between a range of technologies and tattooing which may yield a wide range of bio-medial monitoring applications and possibly even interaction with communication and or entertainment technologies. The rapid growth in publications within the literature seems to suggest that opportunities exist for health and scientific personnel to position themselves as key players/experts in this area and the wider tattoo industry is likely to benefit from their expertise and participation. Internationally no industry group has made a concerted effort to bridge the information gap between the medical & scientific community and with the broader tattoo industry, reviewing complex information within the medical and scientific literature is a mammoth task and we have limited resources yet CosmeticTattoo.org has made a significant attempt to bridge the information gap via our internal publications and news stream in an effort to make complex information accessible to industry members with diverse educational backgrounds, however we can only continue to do so with genuine support from our members. Copyright © 2018 CosmeticTattoo.org & the article author All Rights Reserved. No copying, transmission or reproduction of site content is permitted without our prior written consent.